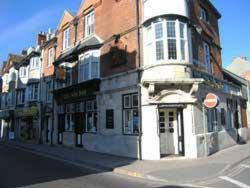 A short walk from the train station and Weymouth beach, this inn offers a homely atmosphere and attractive sea views. The Sun Inn is situated just a short walk from Weymouth''s magnificent beach, which offers golden sands and safe, shallow waters. During summer it''s a magnet for all ages: ideal for families with young children, perfect for sun worshippers and a relaxing spot for those just wanting to soak up the seaside atmosphere. The Sun Inn is the perfect base for your holiday. Nigel, Jackie and Emily welcome you to the bar, which has a lovely, traditional pub atmosphere. Play a traditional game of darts or try the latest games on our Itbox. Live music takes place on Saturday nights.